What’s up everyone! Hope you’re having a great week. With pumpkin everything going on – I couldn’t help but want to make my pumpkin roll that I created a few years back for the blog. This is a recipe that I am constantly playing with to figure out different ways it will work. I remember seeing my successful “fueling” pumpkin roll recipe work & I was so pumped. Since a few years ago, I’ve also created a (dairy free) version here with a coconut milk “cream cheese” filling. My first original recipe called for 5 egg whites and I knew that I could switch some things up so I went with 2 whole eggs & 2 egg whites and it turned out awesome, if I do say so myself. So here is my updated recipe for you to try! This would make a perfect dessert for Thanksgiving or part of your breakfast with coffee, justttt sayin! * I also added 1 tsp of xanthan gum to make it more of an “icing consistency”. Xanthan gum is a thickener. Use code “XUG228” for $5 off your iherb.com order for any order under $40 and $10 off any order over $40. Combine your greek yogurt, chia seeds, vanilla, all spice, optional xanthan gum, & sweetener & mix together. Set in the fridge so it will “thicken” while you prepare your pumpkin roll. Grind your Oats into Flour in a food processor or magic bullet. Add all dry ingredients into a bowl & mix. Add in your eggs, pumpkin, & vanilla – mixing thoroughly. Once the pumpkin mix is blended together, it should be a thick batter. 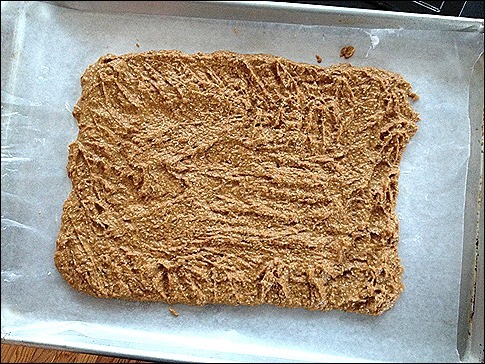 Put the batter onto a parchment lined & sprayed cookie sheet in a long rectangle shape. 6. Bake at 375 degrees for about 14 minutes or until firm. 7. 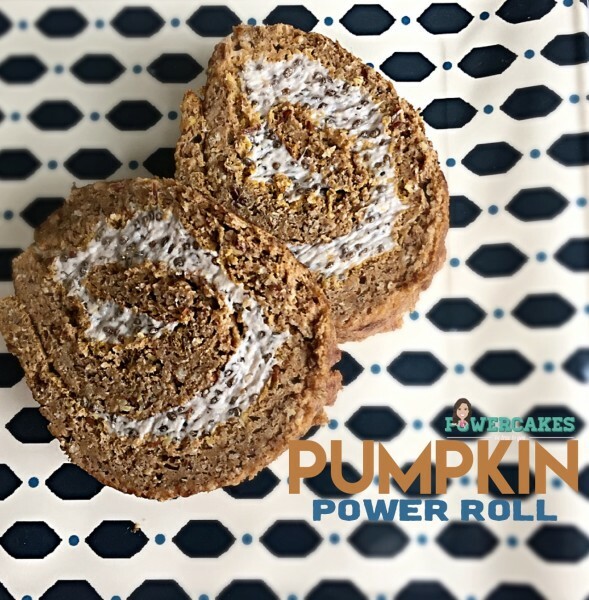 Once cooled for a few minutes out of the oven, flip the pumpkin roll onto a towel dusted with some cinnamon & sugarless sugar (or coconut sugar would be good here!). 8. 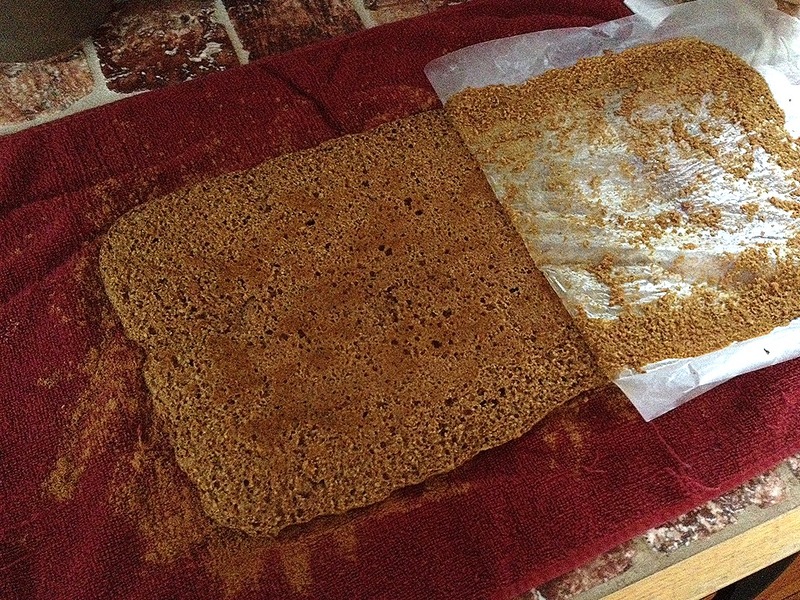 Peel back the paper carefully – Sprayed parchment paper comes off much cleaner than mine did! 9. 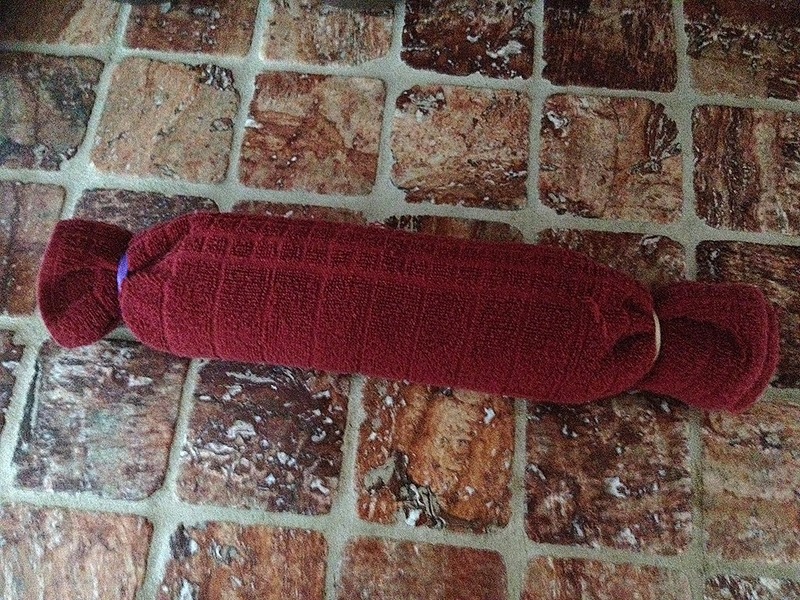 Once parchment is rolled off, roll the towel in with the pumpkin roll until you make a nice log. 10. I secured the ends so the cinnamon/sugar mix wouldn’t spill out. 11. Let cool (outside if chilly enough) or inside until completely cool. 12. 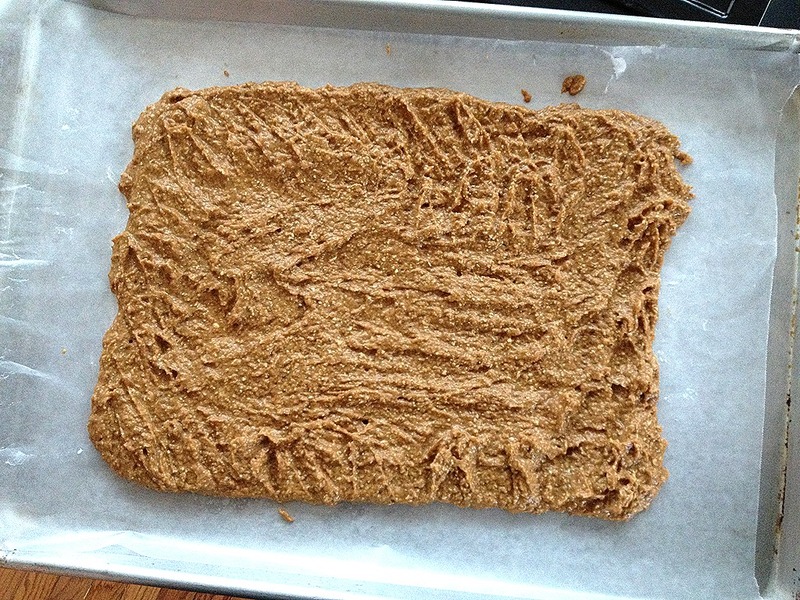 Once cooled, unroll carefully & spread the coconut chia frosting on the roll. 13. 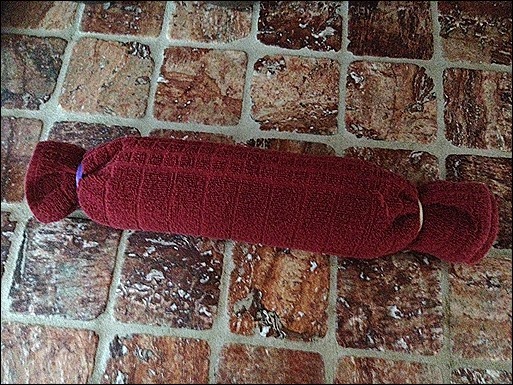 Roll back up the pumpkin roll without the towel into a nice log. 14. Cut the ends off (to eat, duh!) and serve to friends, family, & yourself immediately or store in the fridge for a few days! 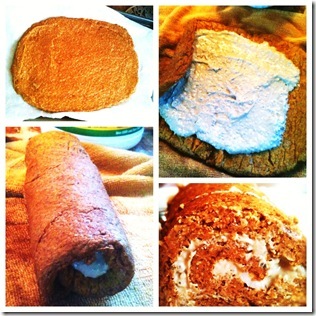 **Also this is more of a “dense” cake roll and not so “fluffy” like an original pumpkin roll – just FYI. I love having it in the fridge throughout the week and topping with peanut butter. If you try it out — let me know! I absolutely love this recipe and really enjoy making it.